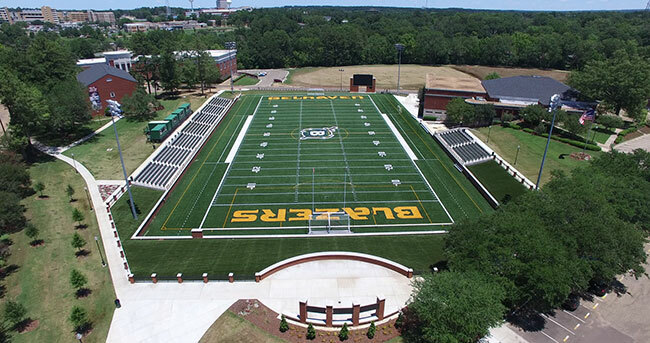 Surrounded by the Fine arts Center, Heidelberg Gymnasium, Helen White Hall, Caldwell Hall, and Hood Library, the Belhaven Bowl Stadium contains the home field of the football and men’s and women’s soccer teams. Located in the heart of the Belhaven University campus, this historic venue has undergone a $4 million transformation, including installation of a custom turf playing surface, comfortable chairback seating for 1200 and a state of-the-art Daktronics video board. Used by various summer sports camps, the bowl is also the site of the famous Belhaven Singing Christmas Tree, the first outdoor singing Christmas tree in the United States. A holiday tradition since 1933, Belhaven's Singing Christmas Tree is the oldest such performance in the country, according to a 1973 article in Southern Living magazine. The event has been named one of the Top 20 Events in the Southeast by the Southeast Tourism Society, an organization dedicated to the marketing and promotion of travel to and within the great Southeastern States. Belhaven first began its outside Christmas performance in 1927 under the direction of choral director Mignnone Howell Caldwell. It was intended to boost morale on campus following a devastating fire that destroyed the main building on campus, and the tradition of an outdoor Christmas concert at Belhaven was born. In 1933, the singers were placed on a platform shaped like a Christmas tree. The performance was originally held in front of the fountain, but was moved to the athletic bowl in 1964 to accommodate larger crowds. The top "star" position of the Singing Christmas Tree is given to the student who sings "O Holy Night," the only solo of the performance.